Any manager/owner will agree, you want your sales force selling and not bogged down with paper shuffling. When interviewing sign companies, we found that sales teams were not often doing what was needed of them; selling. They were bogged down with paper pushing and working their way through the system. With this in mind, we made the proposal section as simple as possible. 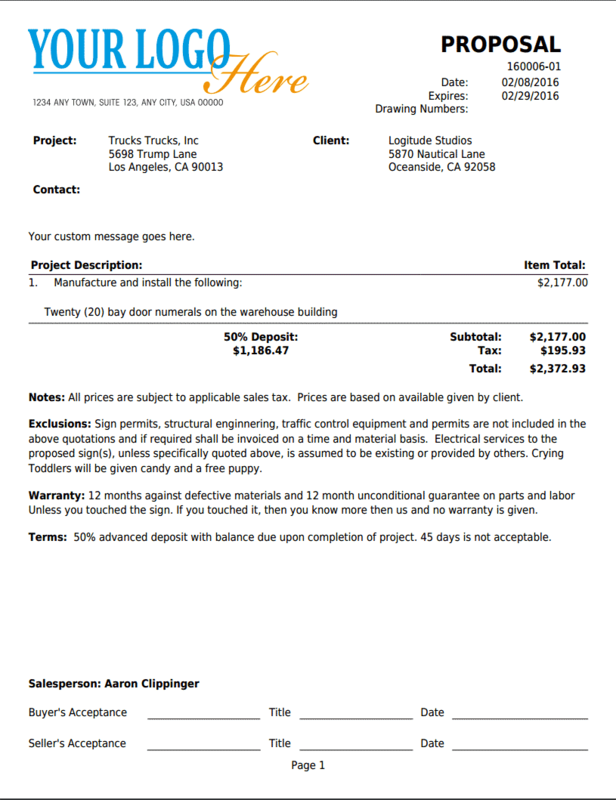 The project site and billing formation are auto-formatted into the proposal and each line is setup with a dollar amount. This ease of writing a proposal will get your team quoting more and spending less time behind the computer screen. Here is the greatest feature, one that your team will love. When writing a revision the proposal will pull the information from the last proposal. So, your change will be just that, a change and not a re-writing of the whole proposal. This means allowing your sales team to focus their time in the right direction. Each proposal is a contract and needs a set of terms. Each company over time learns (the hard way sometimes) what to cover in the terms of a contract. In V Sign Software you will be able to insert your custom terms into the proposal and this will be auto populated into each proposal. Once setup, proposals will be quick and easy.